The HD + resolution is not up to date, but still acceptable. The installed camera sensor does not fully exploit the potential but it is good and the selfie camera also does a good job in contrast. 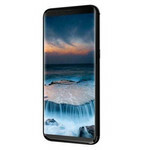 An advantage of one or the other possibly the display size of 5.7 inches, which is a good compromise between the large 6 inches of a Phablets and the now increasingly occurring 5.5-inch displays. So if we have aroused your interest in Uhans i8, we have the excellent news that now you can buy it on Gearbest to use coupon code: UHANSi8phone at $130.99. [Análisis] UHANS i8, ¡El móvil "todo pantalla" más anticipado del año ya en preventa en GearBest! Positive: Good price; impressive design; nice display; good processor; 4GB Ram; USB-C. Negative: Only 64GB ROM. Positive: Good price; nice design; decent display; good hardware. 0.202 kg: Dieses Gewicht ist typisch für Smartphones.